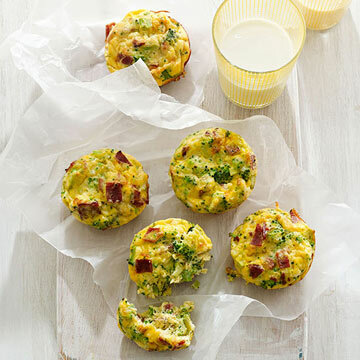 Maximize weight loss by starting your day with a substantial meal of whole grains and lean protein. 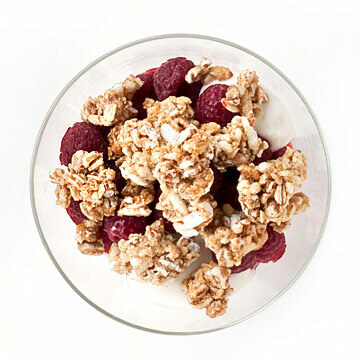 Layer a 6-ounce cup 2% honey-flavored Greek-style yogurt, 1 cup fresh or frozen raspberries, and 1/2 cup Kashi GoLean Crunch cereal in a glass (you can prepare this the night before and cover with plastic wrap). 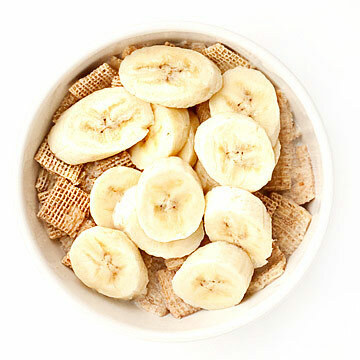 1 cup fiber-rich cereal (such as Multi-Bran Chex) with 1/2 cup fat-free milk and 1/2 medium banana, sliced; 1 hard-boiled egg. 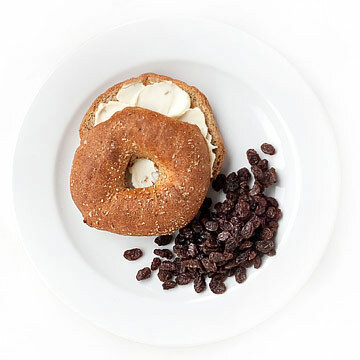 One 3-ounce whole-grain bagel spread with 1 Laughing Cow Light cheese wedge, 1/4 cup raisins. 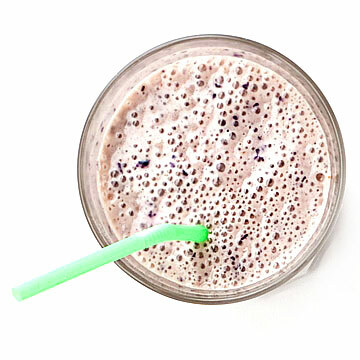 Combine 1 packet No-Sugar Vanilla Carnation Instant Breakfast, 1 cup fat-free milk, 1 tablespoon almond butter, and 1/2 cup fresh or frozen blueberries in a blender until smooth. 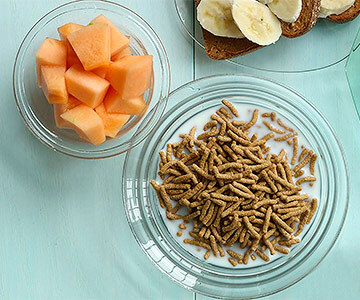 1/2 cup steel-cut oats made with 1 cup fat-free milk. 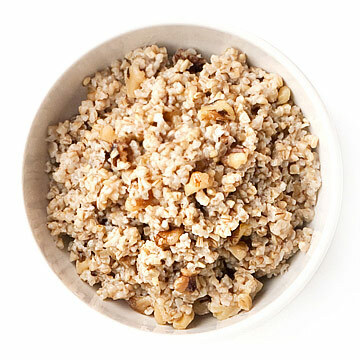 Mix in 1 tablespoon each maple syrup and chopped walnuts. 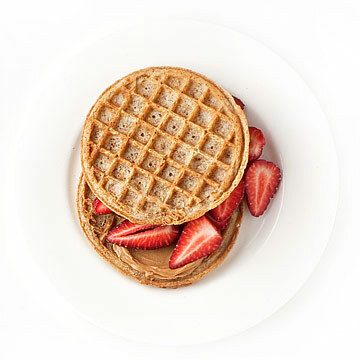 Spread a whole-grain waffle with 1 tablespoon natural peanut butter, layer on 1/2 cup sliced strawberries, and top with a second waffle. 1 cup Raisin Bran cereal, 1 cup 1% milk, and 1 cup cantaloupe cubes, 225 calories. 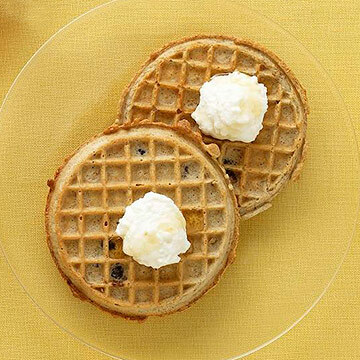 2 whole-grain blueberry waffles with 1 tablespoon honey and 2 tablespoons part-skim ricotta cheese, 284 calories. 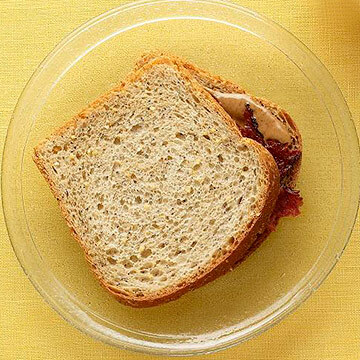 2 slices reduced-calorie bread with 1 tablespoon almond butter and 2 slices turkey bacon, 240 calories. 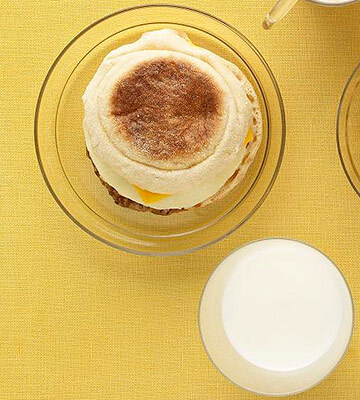 Jimmy Dean D-Lights (turkey, sausage, egg white, and cheese on a whole-grain English muffin) and 1/2 cup 1% milk, 300 calories. 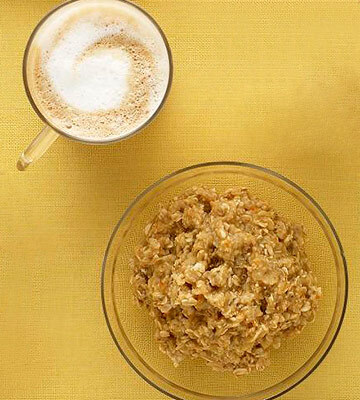 1 packet Kashi apple cinnamon oatmeal made with water and 1 short nonfat cappuccino, 280 calories. 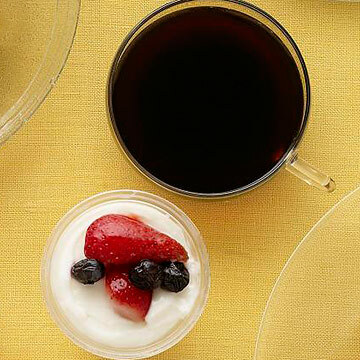 Fruit and yogurt parfait with granola and 1 cup black coffee, 250 calories. 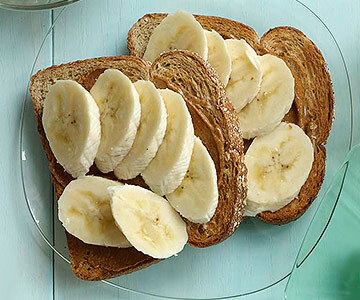 2 slices Pepperidge Farm Light Style soft wheat bread, toasted, with 1 tablespoon almond butter and 1 sliced banana. 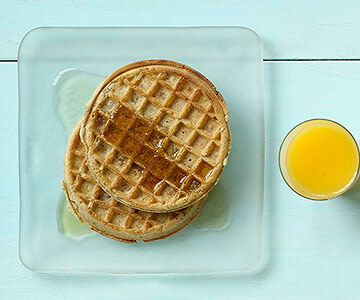 2 whole-grain frozen waffles, 2 tablespoons maple syrup, and 1/2 cup orange juice. 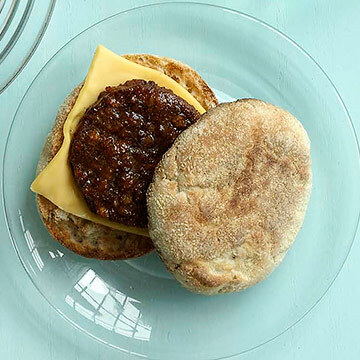 1 light Fiber One English Muffin with Morningstar veggie sausage patty and 1 slice of reduced-fat cheese. 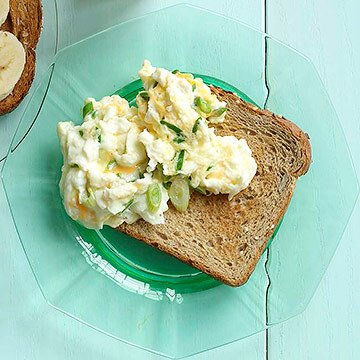 3 egg whites scrambled with 1 ounce grated reduced-fat cheddar cheese and 1 sliced scallion; 1 slice whole-grain toast and 1/2 cup orange juice. 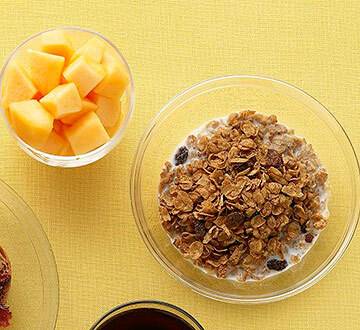 1 cup Fiber One Original Cereal, 1 cup 1% milk, and 2 cups cantaloupe cubes. 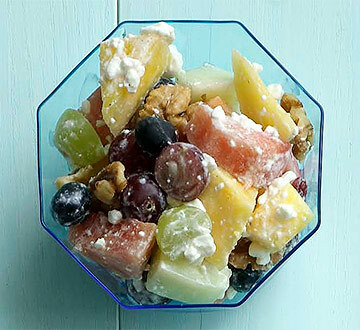 1 1/2 cups fruit salad and 2 tablespoons walnuts tossed with 1/2 cup 2% cottage cheese. 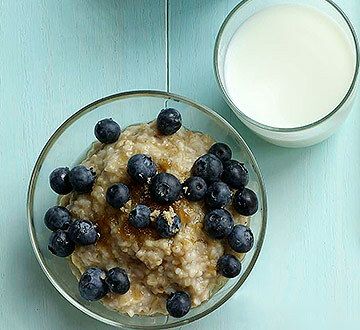 1/2 cup steel-cut oatmeal made with water and 1 tablespoon brown sugar, 1/2 cup blueberries, and 1/2 cup skim milk. 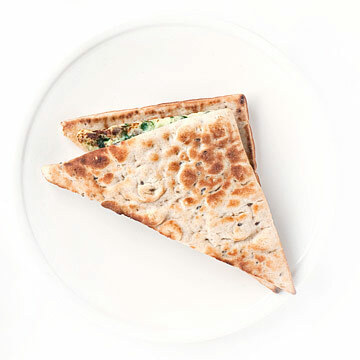 Originally published in the May and June 2009 issues of Family Circle magazine.